CRM software isn’t as common on Mac as it is on Windows but we’ve reviewed the very best CRM software for Mac users running small businesses in 2019. Effective Customer Relationship Management software helps you achieve greater efficiency in customer management and maintain your client database saving you time and stress. It’s also an essential complement to any project management solution for Project Managers, sales territory mapping software or email marketing tool on your Mac. We’ve looked at a mix of both cloud based and desktop CRM apps suitable for everything from small businesses to freelancers. Many of them also integrate with accounting applications and pay roll solutions on Mac so that you can manage your entire small business within macOS. Here then are the best small business CRM tools for Mac users in order of ranking. The best thing about OnePageCRM can be summed up in two words – simplicity and efficiency. It really doesn’t come much easier or simpler to use than OnePageCRM which uses a highly effective to-do-list approach to CRM. Although it’s a very simple approach to CRM, it’s clearly successful as companies such as T-Mobile, Remax and Hewlett Packard have used OnePageCRM to convert leads into sales and manage their customer base. OnePageCRM is based around Dave Allen’s well know Getting Things Done (GTD) philosophy and aims to keep your sales team’s focus on converting sales instead of navigating around the CRM app itself – which is definitely no bad thing. One really nice touch is the Easy Lead Capture tool which can automatically import contacts from Gmail, Outlook, Twitter, Facebook and Xing. This works in your browser and requires just one click to send leads to OnePageCRM. OnePageCRM works in any browser on Mac although there is a dedicated mobile app for iOS and Android too. If you’re looking for a CRM tool to simplify the sales and lead generation process on your Mac, OnePageCRM cuts out all the noise and keeps your team focused. Another advantage of OnePageCRM is that it doesn’t charge you for features you don’t need. There’s one simple pricing plan of $11 per month which allows unlimited contacts and notes plus integration with MailChimp, Google Contacts, Outlook etc. If you’re not satisfied, you’re not tied into a contract and you can quit at any time. You can get started now with OnePageCRM for free with no credit card required to judge for yourself. Daylite is an amazing, easy on the eye customer and project CRM software designed specifically for Mac and iOS devices. Daylite can be scaled up for medium to large businesses or enterprises but is also an excellent starting point for small businesses too. Daylite puts the focus on project management, giving you a clear overview of patterns and stats across your ongoing projects. Daylite isn’t an SaaS solution and it lacks sales and financial planning features because it focuses on helping you stay organized with your projects, especially on the move thanks to the iOS app. Daylite is organized into 8 different areas – Calendar, Contacts, Objectives, Tasks, Notes & Email, Forms, Groups and Reports. Since Daylite is aimed at Project Managers, it gives an amazingly in-depth and easy way of keeping tabs on multiple projects at once. In particular, the Timeline view brings a Facebook style way of tracking project statuses, emails and meeting schedule in real time. Daylite is integrated with iPad and iPhone with a simple, elegant interface that’s tailored for macOS. Daylite also has a ton of features including shared calendars, tasks list and projects organizer. Although it doesn’t have it’s own email client, it does integrate with Apple Mail and adds a Daylite sidebar to Mail which allows you to add and remove contacts in Daylite. You can view a contacts details in the timeline and easily edit and manage contacts via the People tab in the left hand menu. The Calendar provides a Google Calendar style overview of upcoming meetings and events which you can also edit and add-to from your iPad or iPhone. You can also create calendars to share with specific colleagues. Reminders can be also be forwarded to your iOS device from which you can also delegate tasks and projects, create smart lists and more. On the downside, Daylite does require its own database server which you either have to setup yourself or you can use Daylite’s own hosting service but this starts at $99 a month. You can however work offline and then sync with the server later. Although Daylite doesn’t cater for the financial side of business, it does integrate with it’s own excellent invoicing app Billings Pro and accounting tool MoneyWorks. Daylite requires a monthly subscription starting at around $30 per user/month and you can try a 30 day free trial. If you need a CRM app that’s got serious project managements tools with excellent iOS integration, Daylite is one of the best CRM tools you can get for small businesses on Mac. If you’re looking for a European based CRM tool that’s easy to setup and use but can grow with your business, Really Simple Systems CRM may be for you. One of the advantages of a European based CRM is that all data is stored in the EU thus avoiding any potential GDPR compliance issues. As the name suggests, Really Simple Systems CRM keeps things straightforward but includes useful extras including automated email marketing and customer service module. It’s also one of the few CRM systems to include it’s own accounting module although you can also integrate with other top accounting software solutions on Mac such as Xero, SageOne and Kashflow. What we like about Really Simple Systems CRM is that you can start using it now for free to begin with and no credit card is required although the free version is limited to 2 users, 100 company accounts and 100MB of storage. Professional plans start at €12 per month and offer unlimited company accounts, contacts, storage, email marketing modules and many other advantages. You can also try the Professional version free for 14 days which has no limits on the number of users or company accounts you can use it with. 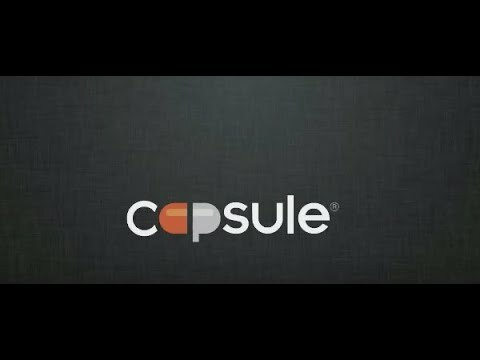 Capsule is an extremely slick, well organized CRM that’s aimed specifically at small businesses. It’s currently used by around 10,000 customers in over 170 countries and is based in the UK. Capsule handles contact management, emailing, activity tracking, lead management and more. What we like about Capsule is it’s extremely clean with strong contact management tools, a highly customizable calendar and useful sales pipeline summaries that make it easy to track leads and share them with your team. Capsule is also one of the most well integrated CRMs with third-party services we’ve seen. Among the highlights are Mailchimp, Google Contacts, Zendesk and GSuite but there are many more ranging from invoicing and accounting apps to inventory management. If it’s not on this list, you can also build your own add-on with the Capsule REST API. For freelancers or individuals, you can use Capsule for free although it’s limited to 2 users, 250 contacts and 25MB of storage. Small Business Professional plans start at £12 per month with support for up to 50,000 contacts, third-party app integration and full sales reporting/forecasting. Subscriptions are pay-as-you-go so you can cancel at any time without penalty. You can start using a Capsule Professional plan now for free and try it for 30 days to see what you think. DataGrys is an excellent professional CRM tool aimed at small businesses. DataGrys allows you to easily enter customer data or if you have them already stored in macOS Contacts, it can import contacts along with any reminders. You can divide customers by Client, Lead, Supplier, Resource and Competitor. DataGrys then allows you to closely track order and purchase details of individual customers and organizations, giving you an overview of what they’ve been billed and what they still owe as well as any pending support requests they have logged. If you need more details, the Orders tab in DataGrys provides a very detailed order overview including payment due dates, shipping costs and tax details. You can customize the tax details according to the region of your customers. The Opportunities tab helps you keep track of potential opportunities with new clients and tracks whether orders with them were won or lost in the end. Keeping customers happy is also a feature of DataGrys with a detailed Support log of issues or problems your customers have had and links to your social media accounts in order to announce fixes and solutions to tickets logged. DataGrys also takes the stress out of invoicing if you’re dealing with lots of clients as it can also automatically generate orders and invoices. You can even track the products of competitors via the Competition tab to monitor how your prices compare with your rivals. DataGrys is overall a very well organized and comprehensive CRM software for Mac although there’s a lot of manual data entry involved to fill in all of the fields to get the most out of it. There’s also no social media monitoring and no companion iOS app either but if you can live without these, DataGrys is perfect for small business owners. The one-off purchase price of $119.99 is quite hefty but there are no other costs such as monthly subscriptions after that and future updates are free. Studiometry Express is a very slick CRM application which is perfect for creating and tracking projects, contacts, billable expenses, contracts, reports and more. Studiometry Express is actually a “lite” version of Studiometry the main difference being, it’s cheaper, for single users and only for distribution on the Mac App Store. The Express version has most of the features of the full version but lacks things like multi-user syncing, Gantt charts and advanced-user summaries. It also doesn’t have advanced project planning features which most small businesses or individuals won’t need anyway. You can see details of all the differences in the Studiometry v Studiometry Express comparison chart. Studiometry covers 7 essential areas of business – Clients, Projects, Tasks, Hours, Expenses, Invoices and Payments. The interface is divided into three convenient columns and the Clients and Projects overview is really useful for having a one screen snapshot of what’s going on. Throughout Studiometry there’s more focus on Project Management than in DataGrys with warnings if your project is about to go over budget or schedule. If you’re a freelancer that works to deadlines or a strict schedule, Studiometry is definitely more useful for you and it also gives a nice overview of all projects completed and their value. Studiometry Express is also very well integrated with macOS Contacts, Apple Mail and Calendar meaning you can sync data easily. There is no social media monitoring in Studiometry but there is a companion iOS app for iPad and iPhone. At $99.99, Studiometry Express is very good value considering it features the best of the full version which is $199.99. If you want a CRM software that combines both project management with standard CRM tool, it’s an excellent buy. There’s also a 30 day free trial of Studiometry for Mac although note that the trial is for the full version of Studiometry, not the Express version. Philasmicos CRM 2 is a simple client management software for Mac aimed at freelancers and small businesses. Philasmicos Contacts is basically a “lite” version of the more powerful Philasmicos R5 CRM but is cheaper and easier to use. Philasmicos Contacts has all of the same CRM features as R5 CRM but lacks Enterprise features such as Supplier Relationship Management (SRM), Personnel Management (HR) and Material Management which are more suitable for large businesses. Philasmicos Contacts features 6 different areas – Customer Relationship Management, Contract Management, Lead and Opportunity Management, Contact Management, Task Lists and Reports. It is well integrated with Calendar, Contacts and Apple Mail and is very easy to install and setup with no external databases to configure. Philasmicos Contacts automatically imports contacts from macOS Contacts and you can manually enter data such as social media accounts. It offers a no fuss overview of any requested, pending and completed customer orders although there’s no way to log customer support tickets apart from adding a memo. Philasmicos Contacts also supports exporting of data to CSV format but there’s no social media monitoring. Philasmicos CRM for Mac isn’t the most advanced CRM software out there but it’s excellent for customer management and very good value for under $50. Gro CRM (formerly Elements CRM) is an extremely slick CRM application that was originally designed for Apple devices. Gro CRM is a Sales, Contact Management and Sales platform designed for small businesses. Gro CMR is incredibly powerful and glossy in presenting and managing your customer data. Gro CRM is excellent for tracking contact with clients, discovering potential opportunities and invoicing customers. For tracking sales and estimating sales forecasts, there are few better looking and more user friendly CRM tools for Mac than Gro CRM. Gro CRM covers just about every business need including analytics, projects, credit card payments, finance and automatic invoicing although it does not support multiple currencies yet. For those with sales staff on the move or out in the field, it also includes a complementary iPad and iPhone app which allows you to do everything that’s possible on Mac. Project tracking isn’t as well catered for in Gro CRM as it is in DataGrys and Studiometry Express but the overall sales tracking is much better. For organizations that need a sales driven SaaS CRM app that looks great on Apple devices, Gro CRM is superb. There are three monthly subscription models offered in Gro CRM – Solo, Basic and Pro which start from $14.99 per month. You can also try a 14 day free trial of Gro CRM on your Mac. No review of CRM software on Mac would be complete without a mention of Salesforce. SalesForce is the biggest and most widely used CRM solution in the World, party thanks to it’s incredibly easy to use interface that workforces of all technical abilities can use. Although SalesForce isn’t designed for any particular platform including Mac, it does now have an Outlook Plugin for Mac. SalesForce is well known for it’s very easy to use interface with some users calling it the “Facebook” of CRM. IT has just about everything including social media monitoring, customer activity tracking and even Outlook syncing. Add to this and incredibly easy to use interface and it’s easy to understand why SalesForce is so widely used. Salesforce certainly isn’t designed for individuals or freelancers but if you’re a small business that’s growing rapidly, it’s certainly worth considering first. You can try Salesforce free for 30 days to see for yourself. There are other CRM solutions on Mac but these are the cream of the crop in 2019. If you’ve got any comments or questions about which one is right for you, let us know in the comments below. There are a few questions worth asking before selecting which CRM software is right for you and your Mac. Do you want a Mac based or Web based solution? There are two types of CRM software on Mac – Mac based and Web based. Some now offer a combination of both i.e. a desktop app with a complementary web interface. Mac based solutions are usually more expensive initially but do not usually require a monthly or annual subscription. It’s also arguably a bit safer if you’re worried about the security of your data as everything is stored locally on your Mac rather than in the Cloud. However, you are responsible for updating the software when new versions are released (with all the technical problems that can sometimes entail) and of course, your data is at risk if you suffer hard drive failure. CRM Web based services are usually cheaper initially and because they are web based so there’s no or little software to install and they’re easy to access from any platform or device. You also don’t have to worry about maintenance or updates since it’s all hosted online. However, web based CRM solutions usually lock you into a monthly or annual subscription model and your data is only as safe as the security system used by the vendor. If you’re not sure whether you are going to stick with using Macs in the future, Web based systems are a safer option as you can access them from whichever platform you’re using. Do you want a multiplatform solution that works on iPhone and iPad too? A small number of Mac based CRM solutions have companion iPad and iPhone apps but most are only built for Mac. Web based solutions have the advantage of being platform agnostic i.e it doesn’t matter which mobile device you use them from. However, just because they are web based doesn’t necessarily mean they will work well on mobile devices so it’s always better to try first. Do you want a solution that also monitors customer reaction on social media? Increasingly, some CRM software providers are also including Social Media monitoring in their products. This allows clients to monitor customer reaction to their products or services on social networking sites such as Twitter. If you receive a lot of feedback on sites such as Twitter, Facebook and LinkedIn from customers or clients, then you might want to make sure your CRM solution includes this. Daylite has retired it’s self-serve product and is pushing users into its subscription based cloud, and it’s leaving it’s self-serve clients behind as of the end of February.